THE latest Lloyds TSB Scotland Business Monitor, now in its tenth year, shows the Scottish economy continuing to grow, albeit at a slower rate. This latest edition for the three months ending February 2008 shows 36 per cent of firms surveyed reporting an increase in turnover, 36 per cent reporting static turnover and 28 per cent reporting a decrease, giving a net balance of +8 per cent, down from the previous quarter and less than a third of that recorded for the same quarter one year ago. The slowdown in growth is affecting both manufacturing and service businesses, with manufacturing reporting a net balance of +5 per cent and services +9 per cent. Although both sectors are experiencing a slowdown, both continue to grow. In contrast, expectations of increasing turnover in the next six months have improved, reversing the trend of falling expectations of the previous two quarters. The overall balance for turnover for the next six months is +23 per cent, up on the +17 per cent of last quarter, but still well short of the +39 per cent of the same quarter one year ago. With a net balance of +26 per cent for production businesses compared with +21 per cent of services, there is a higher level of optimism in the manufacturing sector. Expectations are now close to the long-term 10 year trend of the Business Monitor. Over the ten years of the Business Monitor there has been a general trend increase in the importance attached to staff availability projected for the following three months. However, for the second quarter in succession, these concerns have reduced amongst all types of business. Despite the “credit crunch”, respondents anticipate little change overall in the risk of a fall in credit availability, while the risk of increasing credit costs is assessed as unchanged overall though slightly up by production businesses. 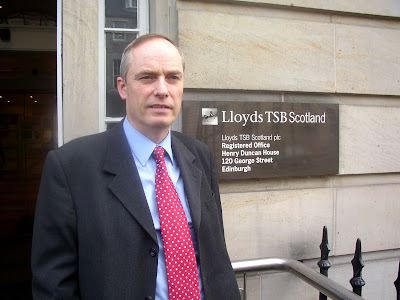 Lloyds TSB Scotland chief economist Professor Donald MacRae said: “Scottish economic growth is slowing from the latest annual underlying growth rate of 2.1 per cent. However, consumer confidence remains robust as evidenced by the latest annual increase in retail sales of 7.1 per cent. Claimant unemployment at 2.5 per cent is the lowest for 33¼ years. House prices in Scotland continue to increase year-on-year, but at a reduced rate.